This is a highly collectable and immaculate Carlton Ware Combination Toast Rack in their Yellow Buttercup Design. 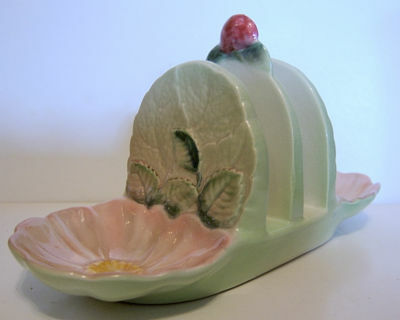 The Toast Rack is one of the Australian registered designs from the 1936/1938 period with the impressed mark 2118 underside.The two-slice green Rack has a small dish affixed at either end for the use of preserves or butter, these in a pink overcolour. The Toast Rack measures 7 inches approx (17.5 cms) in length. There is no visible sign of damage at all.